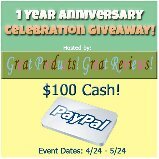 so they are hosting a $100 Paypal Cash giveaway for their readers and mine. and Real Moms Review. Please check them out! plenty of fantastic information in Bride’s magazine.